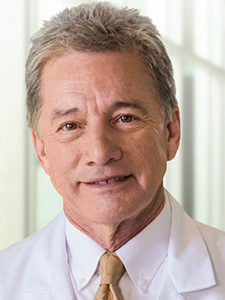 Dr. Alan M. Keller completed his undergraduate studies at Oklahoma State University and received a medical degree from the University of Oklahoma School of Medicine. He completed his residency in internal medicine at Boston City Hospital and a fellowship in medical oncology at the National Cancer Institute (NCI), where he remained for one year as senior investigator. He has served as principal investigator for the NCI-funded Community Clinical Oncology Program and was formerly the Medical Co-Director of Clinical Research for U.S. Oncology. Dr. Keller continues to serve on the medical and scientific advisory boards of several pharmaceutical companies that are developing new cancer treatments. He has served on the Medical Oncology Exam committee of the American Board of Internal Medicine, designing the test for medical oncology board certification and the ASCO Task Force in medical oncology research. Dr. Keller is certified by MD Anderson Cancer Network®, a program of MD Anderson Cancer Center.